Star appeal is an abstract phenomenon; some entertainers are born with impeccable comic timing, others with twinkling toes, while few latch themselves on to a godfather and going down the make up and training route, strut the stage. And then there are the few who simply exude elements of style and give off vibes of a elevated persona; it is done with such effortless ease that the mass public cannot help but regard the artist with a degree of awe. nor was it mere experimentation she managed to emerge almost triumphant. Ladies and gentlemen, here's Atiqa. 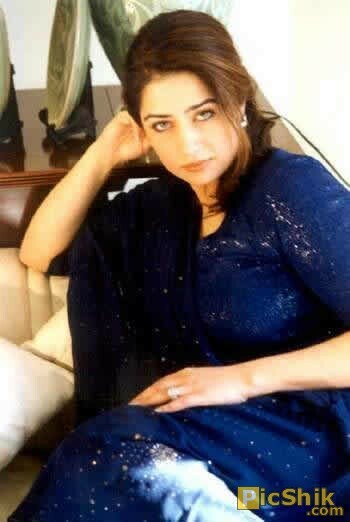 The same Atiqa Odho who was a triumph in Sitara and Meherunnisa, the same Odho girl who lent credibility to Nido and Citibank and the same Atiqa who crashed through taboo barriers and took on the role of Shaan's mother. Although all performers start with high ambitions, yet the large variety of them end up pandering to conservative social dilemmas and perhaps curbing whatever little joie de vivre they started out with. Therefore whilst playing the co-host at the recent Lux Style Awards, Atiqa stunned the audience with a single remark. Flicking back her hair in trademark femme fatale style she responded in part dialogue to Marina Khan's question "What did you wear on your wedding?" by cooing "Kaunsi shaadi? Pehli, doosri ya jisey akhbarat likhte hain hone wali hai?" The medley of giggles, snickers and "ohmigod how could she!" ensued. Atiqa was disdainful. She was merely living up to her own adage of "darling if you have to do it, do it with style." The onlookers and particles of the industry have varying opinions. Some call it a "begum act" others shudder at what they feel is "excessive high maintenance" yet this is one woman who knows her mind and thank heavens is not part of the clique whose tale commence on a note of a young damsel in distress being thrown on to the ramp and told to shed its cocoon. Moving around in a whirl of meetings and shootings, the clichÃ©s of a harassed secretary and an enthusiastic mother do prevail but calling the shots is an ambitious mother of three who appealed to the public from the day she appeared onscreen to sell Lux soap in the late eighties. The lure of light eyes, a gora complexion and lots of confidence appealed to the masses and from then onwards the onstage saga began. It is a mindset varying from the norm at the moment, as numerous Asian productions are making their presence known globally with films heading towards the Oscars and channels supplying the desi culture from Timbuktu to New Zealand. Atiqa feels that "more than one element keeps our Pakistani programs from moving abroad, not just the financing which would be required for such a project, also the size of a select audience it would be catering to. "It has taken a project like Lagaan for the Indians to break in to the foreign scene and with our home in such a mess we need to sort things out here before moving anywhere else." In the early years one of the most common sights onscreen was her portrayal of a young mother trying to convince the pesky brat to consume a glass of Nido or tell all the onlookers to use a particular brand of cooking oil. Debuting as Anwer Maqsood's Sitara she enacted the pretty and fragile character who invoked empathy and reactions that made the average Jane relate more to her than the firebrand Mehrunnisa thus ensuring that a star was born. "A lot of it depends on kismet, the way people receive your play or react to it." Going by her career chart you do believe her statement that all her roles have a strong element of diversity to them. Instead of forever playing the spoilt little princess or the Muslim social drama post Sitara aur Mehrunnisa she went on to do the role of a slum- living, perpetually pregnant woman in Nijaat which was part of the family planning propaganda. "There were lots of people who warned me against doing that play. They all said that I would be slotted forever in the de-glamorized role, but I went ahead and it worked." Explaining how "people think I take my work very lightly and it is part time hobby for me but little do they know that not only does it hold extreme importance in my life I also do take it extremely seriously." It is back to television these days, not just as the producer of a television serial that is going to be directed by her long time friend Marina Khan. Also on the cards is producing and hosting a talk show aimed at showcasing the creative genius of Pakistan. "Basically I love people, and I feel that there are so many of them who have contributed to society not just by doing charity work or such noble acts but even by generating a controversy they add to the growing picture. I want to discuss with them the good, the bad and all the other issues ranging from the environment to what their interests were and why they have spent their lives nurturing them. Having shot a number of episodes I was very surprised to see that most of them are very patriotic despite the fact that some have gone through a pretty rough time here but amazingly their spirits do not sag." What sets her and a few select apart from the television behnjis and the film starlets is the different attitude. Loathing the constant moaning and whining that is carried out by the entertainment industry en masse, she says: "A lot of people bemoan the lack of professionalism and the work conditions here. But as I keep telling them this is the one place where you can stand out and carve a niche for yourself." Instep recently carried a story on the hypocrisy of PTV's censorship policy; her opinion on the subject was that work frustrations have little to do with what is not allowed. Instead her primary concern lies with how private productions are dealt a worse hand. "A PTV show can get away with so much more as it is a part of Pakistan Television's in-house efforts. Her outrage at the treatment of private production houses who are not just providing programs but also paying for the on air time is that "on one hand a constant reminder of what is allowed and what is not continues and on the other you have the cinema catering to the masses which shows ten-year old children holding guns." To her it is more about fair play than a self-imposed moral brigade. "But the issue lies with the fact that right now we have shows on television where there are nautch girls performing and if it was a level playing field I would have no problems with it. The things we can't do by holding hands and embracing, need to be done through emoting expressions. It is so much more difficult to show physical attraction here than anywhere else because here it is all in the eyes, and that makes it very challenging." Quoting a recent episode, she said "A scene from a play of mine with Humayun Saeed was hacked because it required his holding my hand and saying that he has found the girl he is going to marry. All of this works in a bizarre parallel mindset because on one side there is a man shown who is using his hands to thrash his wife and that is allowed but when the other uses it to project softness it will be hacked." The response given to her inquiry about this incident by a television official was a sheepish "I am sure someone is very jealous that he (Humayun Saeed) was holding your hand." Moving on to the subject of cinema her decision to act in films had its degree of shock value. It was, and perhaps still is, something females hailing from a socially prominent background just do not envisage themselves doing. Once again before embarking on this note she received a fair share of warnings and the logic given was that it attracts a particularly unsavory audience. Her answer is brief ad to the point. She has catered to exactly the same viewer ship courtesy television "and although TV has a censorship policy a lot of crap is shown on it." She maintains her stance that "if a change has to be brought about it will have to be generated by people who know what quality is all about." Atiqa recalls an incident a week before Jo Darr Gaya Woh Maar Gaya's shooting began. She was at the television station and was being criticized by most people sitting there viz a viz her move towards celluloid. The station manager became her sole supporter as "he looked at the group of sitting around moaning the fact that something needed to be done to repair the film industry, and just said that at least she is going ahead and doing it instead of just making small talk." The underlined desire is an attempt to put together a good creative team for a commercial film. "Art cinema has never been an option because you have to be responsible enough for the market you are working for and money does play an important role. In this business, as any other, you have to be very careful and responsible when dealing with other people's money. There are so many people I have come across through the style, fashion and film industry who insist that they want to do a film but cannot work with the current film mafia." And yet despite the careful planning, flops like Mummy did happen. The excuse being that "my intentions were correct. Often we enter a project with the right intentions but it just does not work out." With three Lollywood films to her credit, Jo Dar Gaya Woh Maar Gaya was the debut vehicle that had her singing duets with Nadeem as she ran around a piano. Followed by Mummy whose fate at the box office was rather barren and the last one being the biggest hit of the trio -- Mujhe Chaand Chahiye. The role of Shan's mother was not one that many actresses below the age of fifty would relish, but Atiqa chatted with the moon during a good part of the three hours and got accolades en masse for it. "None of my roles have been typical. The glamour is there, the songs are there and the dancing was there. But I am essentially there as a performer and that is exactly what led me to play Shaan's mother in MCC. It was not a Barbie doll role and that is one thing I would hate to take on." As a New Yorker she was there during the September 11 attacks, and you wonder if there was a feeling of vulnerability and fear at any time for a foreigner in Manhattan? She denies it, utterly used to absorbing all in to her stride and claims not to have faced or felt any kind of discrimination or difficulty. "The emotional reactions of the masses were exhibited and then it just all retreated as normal life went on." Having acquired a certain amount of technical knowledge courtesy workshops and classes in happening New York, her aim is to try and uplift the entertainment industry which has been completely ignored in this country for so many years. She is savvy enough to understand and accept that overnight miracles will not happen and with other, greater problems to be faced in a world gone mad, a change in the entertainment industry will take time and oodles of patience. The realisation does nothing to deter her. This modern day sophisticate rushes around, flashing her diamonds one moment, balancing her briefcase the next, instructing the secretary all the time. The phone buzzzes constantly. It's just another working day in the life of a woman named Atiqa.